The old-school feel of OPC but with a modern, chromium flair, 2017-18 O-Pee-Chee Platinum Hockey takes NHL fans on a colorful journey. Each hobby box has one autograph and a whole mess of parallels and inserts. 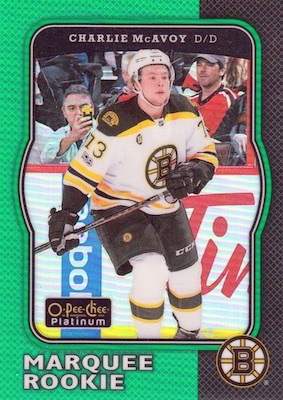 The flashy cousin of the primary '17-18 O-Pee-Chee release, 2017-18 OPC Platinum does not go as wide in its card coverage, but it makes up for that with a plentiful collecting rainbow. Just as in the 2016-17 set, the base lineup consists of 200 cards, including 140 veterans, 10 legends and 50 Marquee Rookie cards. Parallels provide wild finishes and even more elaborate names. In addition to the base Rainbow (1:4 packs), there are Violet Pixels (1:10 packs), Red Prism (#/199), Royal Blue Cubes (#/99), Seismic Gold (#/50), Orange Checkers (#/25 - Hobby), Emerald Surge (#/10) and Golden Treasures (1/1) editions. 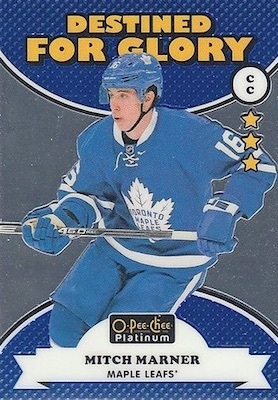 Adding more options, the 2017-18 O-Pee-Chee Platinum checklist incorporates several inserts. Combining to average three per box, choices take the form of the Destined for Glory (1:22 packs), In Action (1:27 packs), and Platinum Records (1:15 packs) cards. These each also have on-card Rainbow Autograph versions. 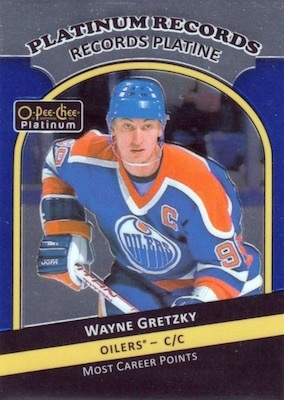 Meanwhile, Retro (1:4 packs) taps into nostalgia with 100 cards that come six per box. Collectors can find one Retro Rainbow in every box, and there is a shot at Blue Rainbow (#/149), Green Rainbow (#/49) and Golden Treasures Rainbow (1/1) parallels. Limited Red Autograph cards are available for veterans (1:300 packs) and rookies (1:150 packs). 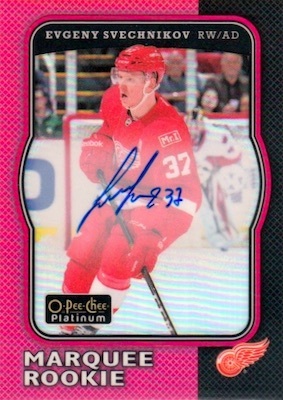 Nearly mirroring the base parallels, 2017-18 O-Pee-Chee Platinum Hockey also has hard-signed rookie autographs. The full breakdown for the on-card Rookie Auto set consists of base versions (1:36 packs), as well as Rainbow (1:180 packs), Violet Pixels (1:1,500 packs), Red Prism (#/50), Seismic Gold (#/25), Orange Checkers (#/15 - Hobby), Emerald Surge (#/10) and Golden Treasures (1/1) parallels. Pack odds key: h=Hobby, e=ePack, b=Blaster. PARALLEL CARDS: Rainbow (1:4 h/e/b), Violet Pixels (1:10 h/e, 1:12.5 b), Red Prism #/199, Royal Blue Cubes #/99 (h/e), Seismic Gold #/50 (h/e), Orange Checkers #/25 (Hobby), Emerald Surge #/10, Golden Treasures 1/1, Printing Plates 1/1 (Hobby). Overall odds - 1:33 Hobby/ePack, 1:330 Blaster. PARALLEL CARDS: Red Prism #/50, Seismic Gold #/25 (h/e), Orange Checkers #/15 (Hobby), Emerald Surge #/10. Overall odds - 1:165 Hobby/ePack, 1:1,650 Blaster. Overall odds - 1:440 Hobby/ePack. 26 cards. Serial numbered 1/1. Overall odds - 1:3.3 Hobby/ePack, 1:2.5 Blaster. PARALLEL CARDS: Rainbow (1:20 h/e, 1:15 b), Blue #/149 (h/e), Green #/49 (h/e), Golden Treasures 1/1 (h/e). Overall odds: Base - 1:300 Hobby/ePack; Rookie - 1:120 Hobby/ePack. Odds - 1:22 Hobby/ePack, 1:17 Blaster. Overall odds - 1:1,400 Hobby. Odds - 1:27 Hobby/ePack, 1:20 Blaster. Overall odds - 1:650 Hobby. 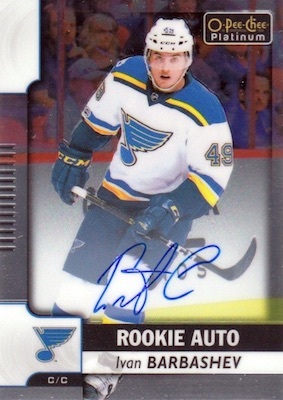 Odds - 1:15 Hobby/ePack, 1:11 Blaster. 2017-18 OPC Platinum Hockey checklist spreadsheet. Still my favouriteset of the year. Never understand why the value is less on the market for these amazing cards. Do you know if it’s still setted for a March 14th release? If so we should get a checklist anytime soon. Saw today that it got bumped back to April 4. So, just days before it was supposed to be released, Upper Deck (quietly) let’s it be known that it is going to be delayed almost a month ? ! ? These cards are delayed usually because the players do not sign the cards in time. Most of this stuff is hard signed. I wish the NHL Players Association would get on the players about this. The players make us wait while they make millions. Upper Deck has contracts with the players and the fans/collectors pay for these cards. Upper Deck does give a hoot about collectors or the fans of the respective sports represented within it’s product. The players or leagues have little input into the designs or product. All of the cost/aggravation is placed on the fan. Upper Deck needs to step it up and stop blaming/justifying their subpar product. Saw a few breaks and as usual was disappointed with this product. 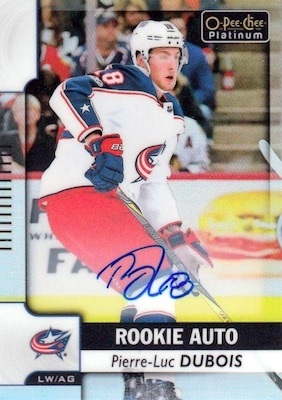 The only good rookie autograph is a freakin redemption of Brock Boeser. Don’t waste your money on this. Very much like last year, but cards are not curved from the laminating and die cutting. Still one of my favorite releases. Hard Signed Auto cards and always a PLUS. Bit of top heavy Rookie Class makes this a big time hit or miss for RC collectors. One of the best products for serial numbered collectors. So much color!! I think the legends in the 80’s era All Star unis is a nice touch. Nice change of pace for many collectors that dont know what a Wale or Campbell is. Cool looking serial numbered parallels to add to PCs of players from the pre-insert era. I’m jut here to say that I have a card that wasn’t in the checklist and wondered why that would be? Would love if anyone reply and explain the purpose or mistake. Thanks so much. 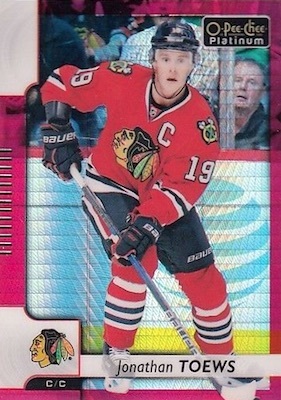 Oh and the card I have is #145 Ed Belfour “Rainbow Colour Wheel” as printed on back and it’s not numbered. 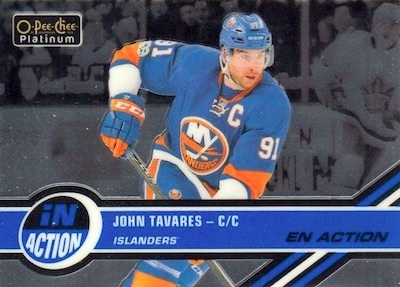 Upper Deck has a lot of cards exclusive to ePack. The Rainbow Colour Wheel is one of these.